2/22/2019 UPDATE: I've added 16:9 support along with some new skins! I made some backgrounds for Drastic designed for screens with a taller 18:9 (2:1) aspect ratio. They're inspired by the 2DS, New 3DS, and GBA. I originally made them for personal use, but I thought I would share it with you guys. There are 4 variants of each skins providing different orientation and shoulder button layouts. There's also 2 backgrounds with a "GBA" style layout, removing the X and Y button. This is useful for games that only utilize A and B. I plan on making variants for 16:9 screens eventually. Make sure to have the on-screen buttons be fully transparent for the best effect. The buttons will more than likely not align perfectly, so just try to get them as close as possible. Last edited by link6155 on Fri Feb 22, 2019 2:56 pm, edited 1 time in total. You know, if you wanted you could make virtual gamepads out of these. They're not hard to make, just a bunch of PNG files. ericbazinga wrote: You know, if you wanted you could make virtual gamepads out of these. They're not hard to make, just a bunch of PNG files. I actually didn't know that you can make custom virtual controller skins. It's not too hard for me to adapt the button for those, I'll make some skins shortly. Dang, I love these! Would love them in 16:9 as well! I love the backgrounds. But it doesn't fit on my screen. It's been a while since I've updated these backgrounds, but here I am! 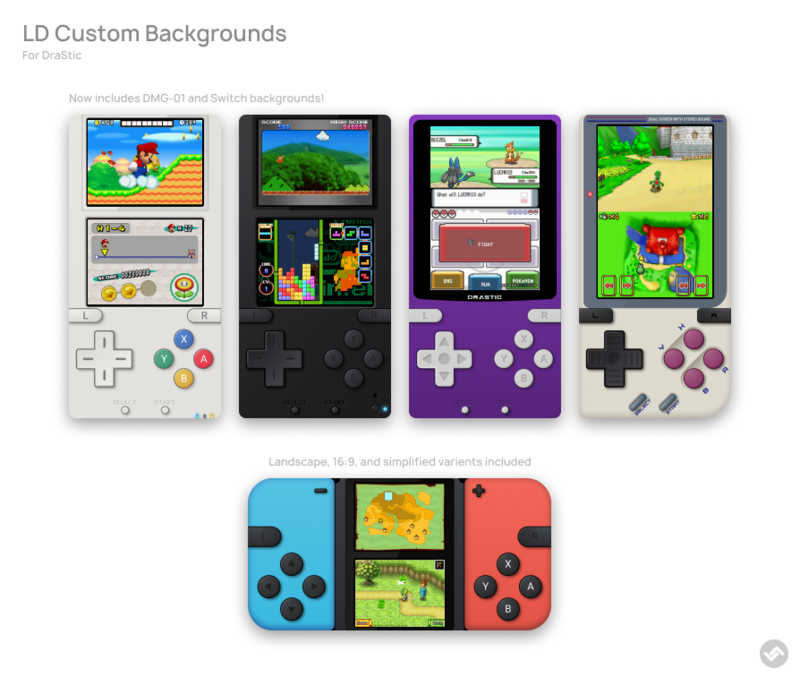 I've now added 16:9 support along with some new skins inspired by the Nintendo Switch and DMG-01 (OG Game Boy). I know I've said I would be making full skins, but I found that not to be feasible with my backgrounds. The main problem is the drop shadow from the buttons. I would either have to shrink down the buttons or remove the drop shadows, neither one looks really good.